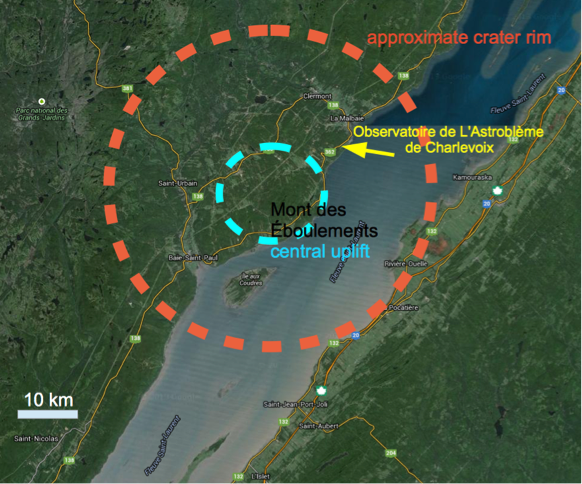 From a communication with the “OBSERVATOIRE de L’ASTROBLÈME de Charlevoix” (Prof. Jean-Michel Gastonguay, academic advisor) the idea arose to present here on our website the Charlevoix impact structure and some of its prominent geologic inventory as well as a hint to the observatory with its museum and geologic route. The institute housed in the Old Club House of Fairmont le Manoir Richelieu is dedicated to the spectacular phenomenon of a giant meteorite impact and its visible traces of highest scientific interest that are found in the territory. The geologic route traversing the whole structure can be followed by Earthcaching (may be borrowed) describing the exposures in very detail. 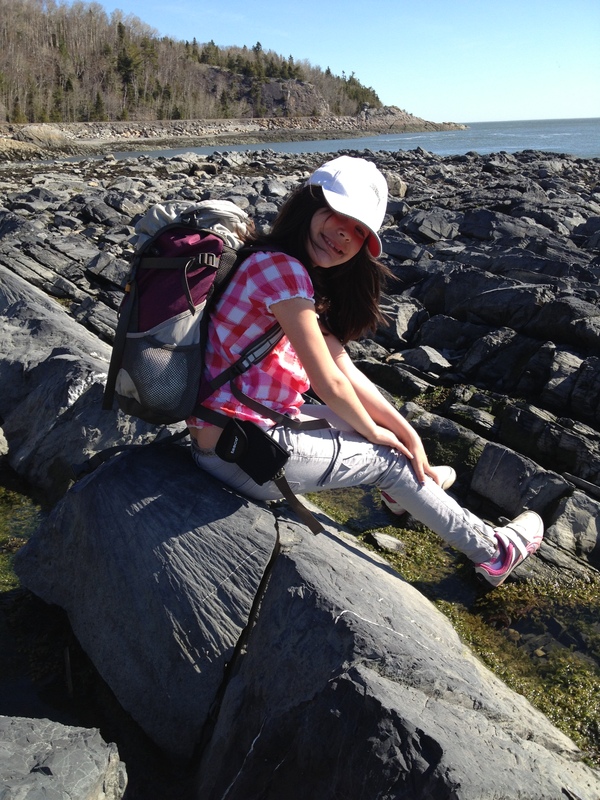 The route has been applied for becoming a Geopark recognized by UNESCO. 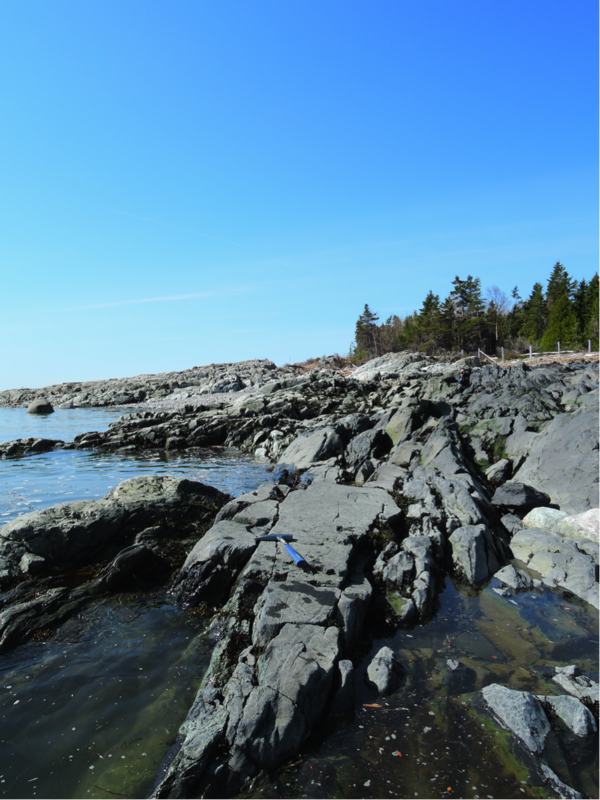 Charlevoix is a deeply eroded large impact structure (the third biggest in Canada after Sudbury and Manicouagan) with a diameter of about 54 km located in Quebec, Canada, and to a large extent covered by the Saint Lawrence River (Fig. 1, Fig. 2). It is a complex impact crater with a central uplift (Mont des Éboulements, Fig. 3, Fig. 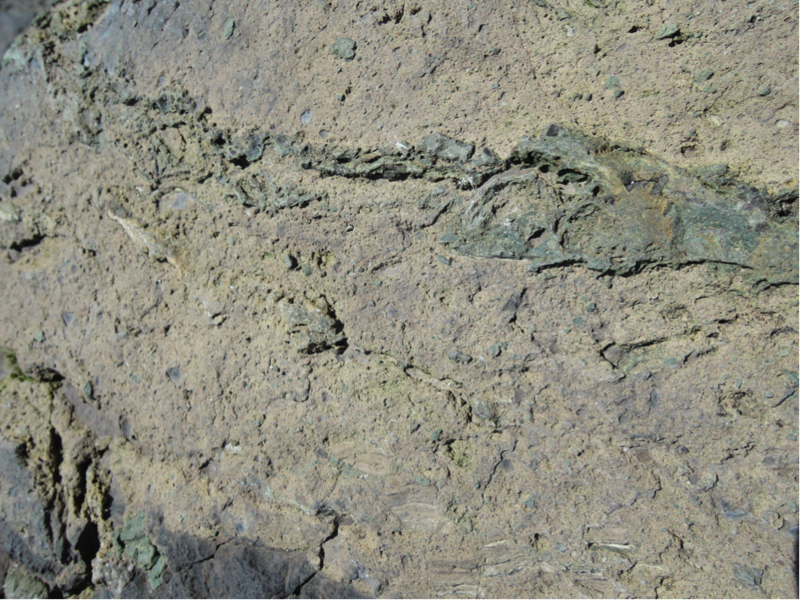 4) and has an Early Carboniferous (≈ 340 Ma) age. Fig. 1. Rough outline of the Charlevoix impact structure. Google Earth. – Click on the images to enlarge! Fig. 2. 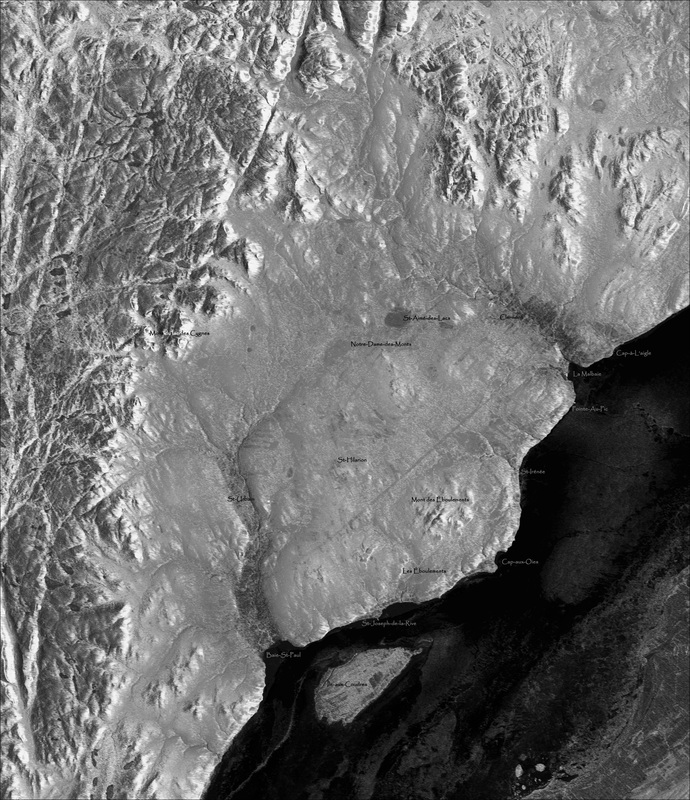 Radarsat image of the Charlevoix impact structure. Courtesy of the Canadian Space Agency. Fig. 3. 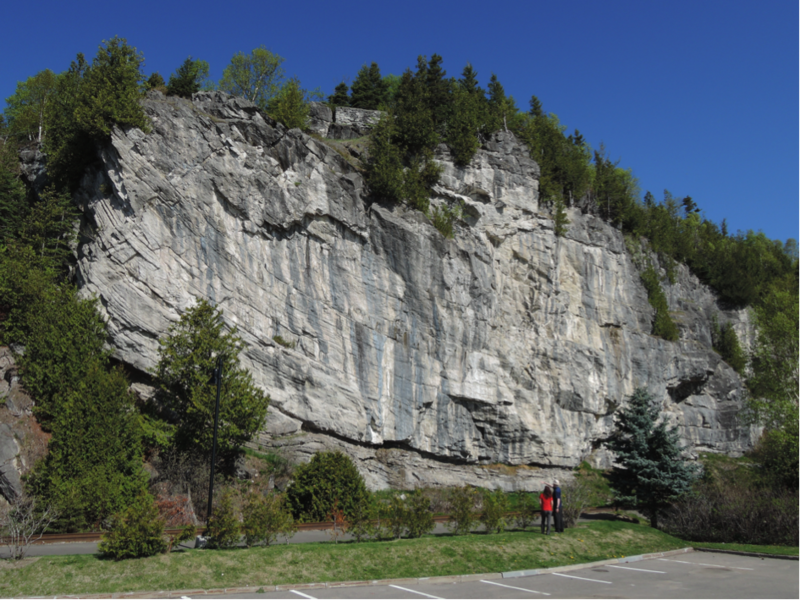 In the background: the Mont des Éboulements prominent central uplift of the Charlevoix impact structure. Fig. 4. A nice comparison: The Charlevoix central uplift and part of the central uplift chain of the Rubielos de la Cérida impact basin (Spain) – La Palomera. Click to enlarge. 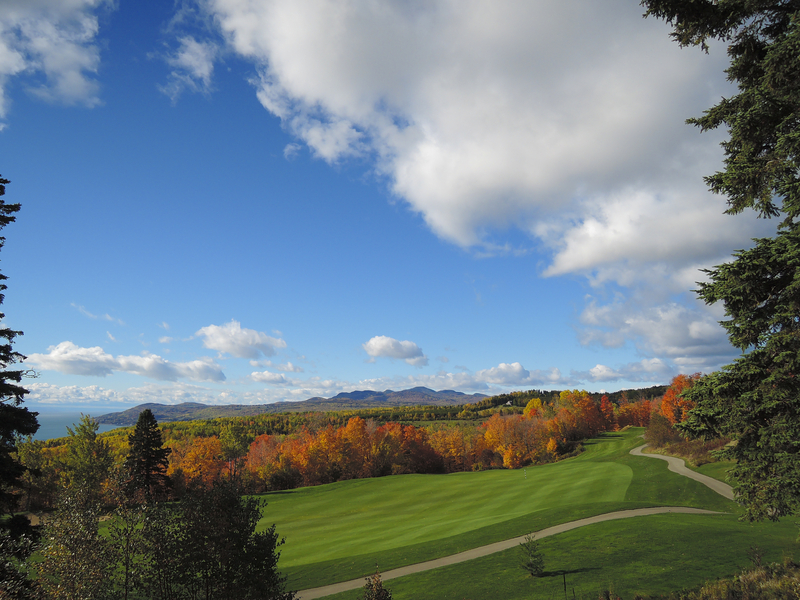 The impact nature of Charlevoix was established since the late sixties by Jehan Rondot who discovered the many highlighting shatter cones and who in the period that followed pioneered the scientific investigation of Charlevoix. The following very impressive photos have been provided by Prof. Jean-Michel Gastonguay, and we are glad to present them here on our website. Fig. 5. Impressive shatter coning in Ordovician limestones. The alignment of the cone axes is a typical feature related with the shock front propagation. On average the cone apices are oriented towards the impact point, but irregular distributions and counter orientations are also observed in impact structures. 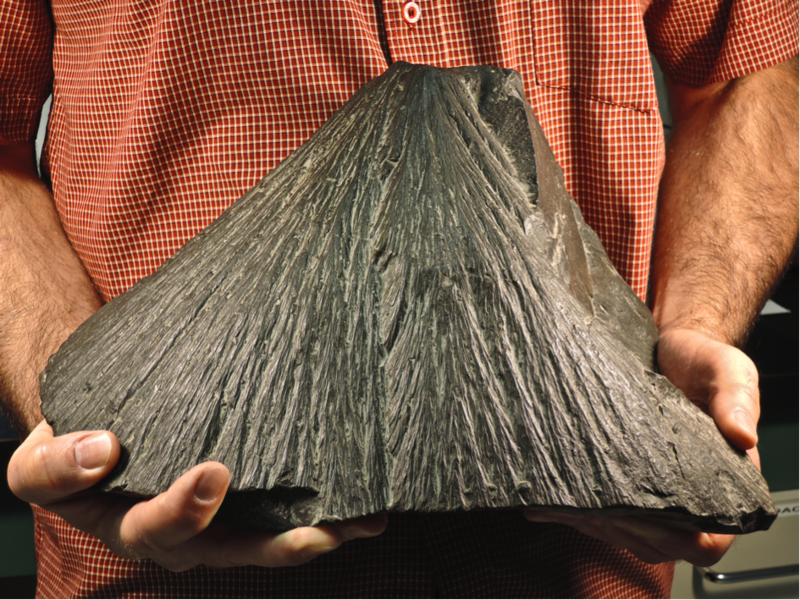 Click to learn more about shatter cones. Fig. 6. …. and with a scale. Fig. 7. What a beauty! 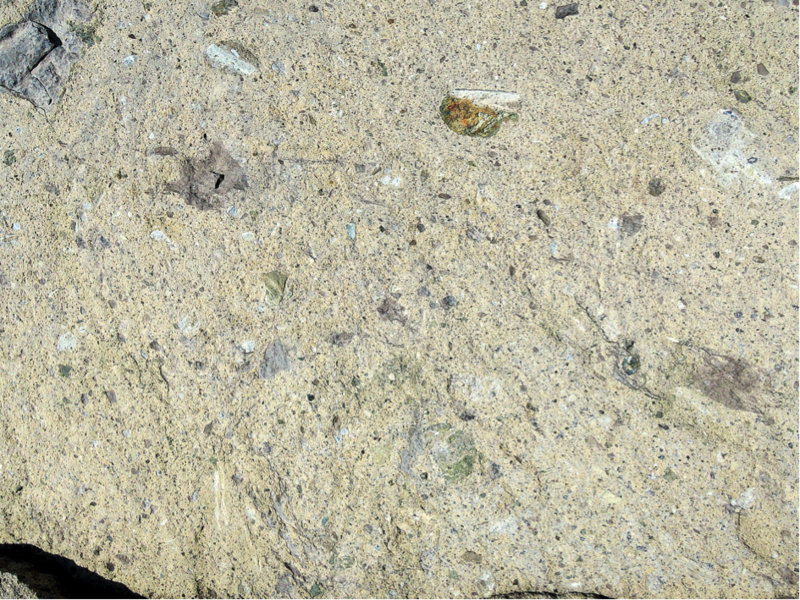 A shatter cone in Ordovician limestone from the Charlevoix impact structure. Very often, these markings are erroneously termed “striations” (even by impact researchers), but in fact they originate from fractures that separate the cone from the host rock, like, e.g., conchoidal fracture markings occurring on breakage of glass. Fig. 8. 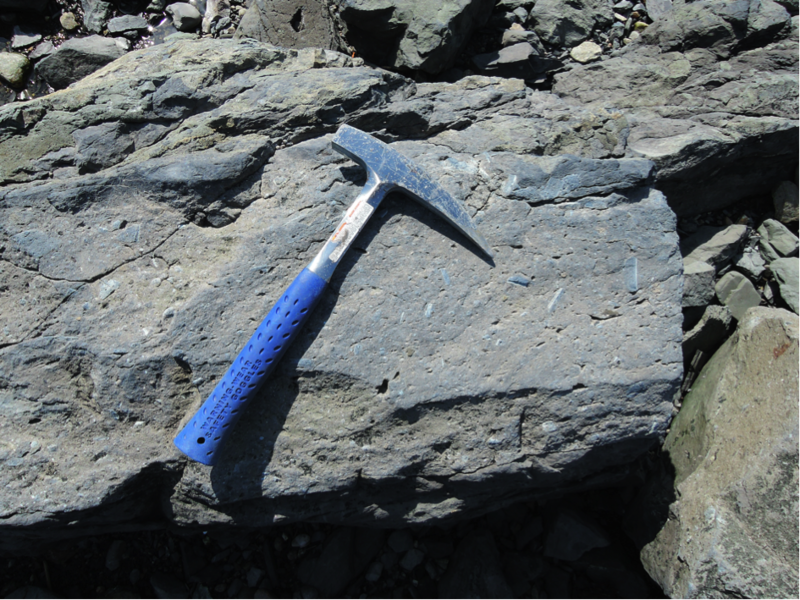 Shatter coning in Precambrian crystalline basement rocks from the Charlevoix impact structure. 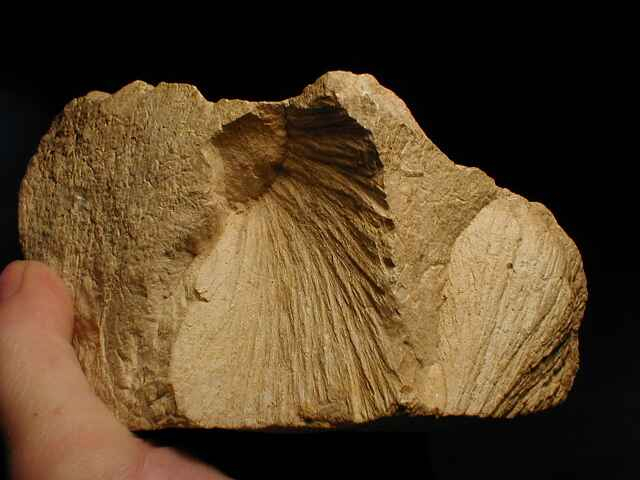 Due to a coarser-grained rock material and a probable texture anisotropy the cones lack the finely sculptured fracture markings and the clear conical shape of the limestone shatter cones (Figs. 5, 7). Fig. 9. 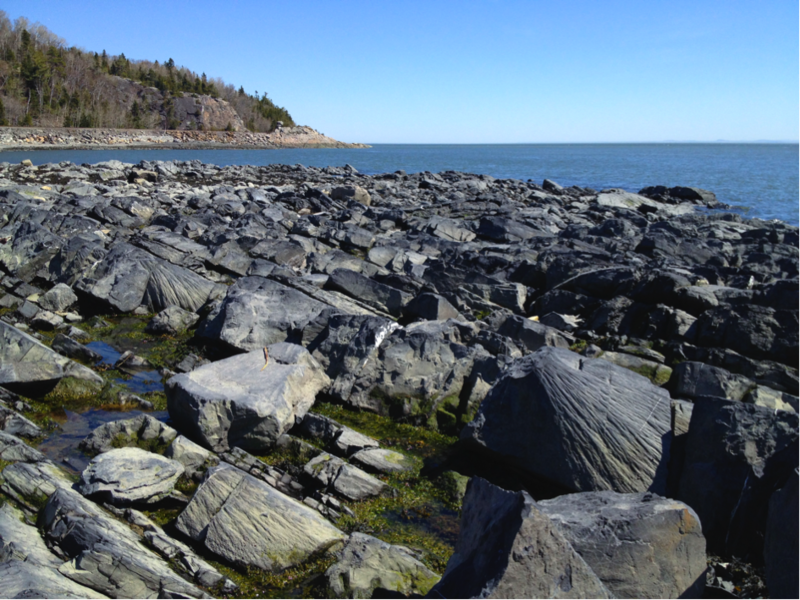 Outcropping suevite beds in the Charlevoix impact structure. Originally, Jehan Rondot named the rock mylolisthenites (from “mulon” to mill, and “olistanein” to slide), but their composition as a polymictic breccia with melt rock fragments in a clastic matrix nowadays classifies them as typical suevites. 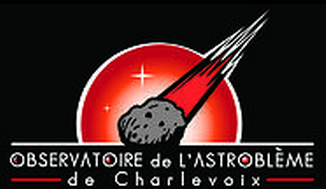 In the sixties when Rondot made his first investigations of the Charlevoix impact rocks, the suevite name location in the Ries crater was widely unknown. Only when the Ries “metamorphosed” from a volcanic explosion crater to an impact structure, the suevite impactite became familiar to impact researchers, and meanwhile suevites are known from quite a few impact structures all over the world. Fig. 10. Closer view of an outcropping suevite (mylolisthenite). In the Charlevoix structure suevites with both crystalline and sedimentary composition are exposed. Fig. 11. Typical aspect of a polymictic suevite (mylolisthenite) breccia from the Charlevoix impact structure. Fig. 13. 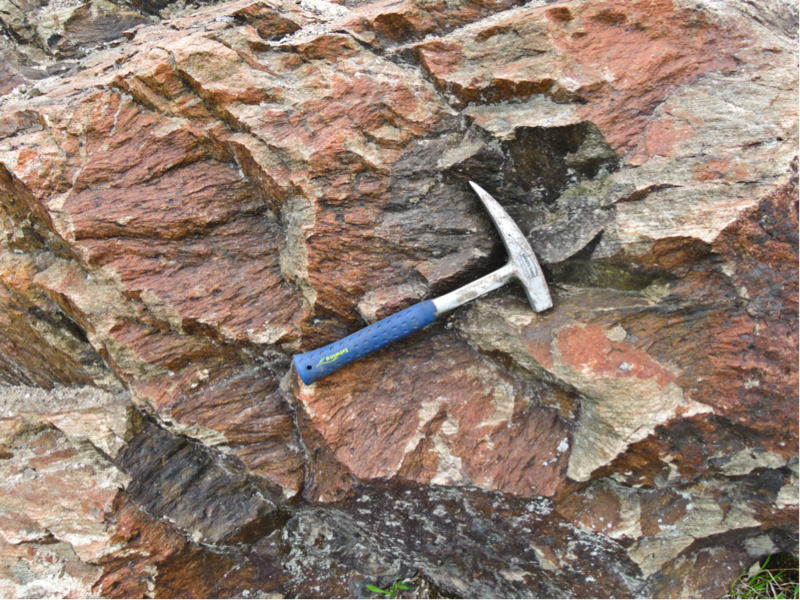 A dike-like intrusion of an impact melt rock (or suevite?) penetrating a Charlevoix suevite (mylolisthenite). Suevite generations or in general impact breccia generations (breccias-within-breccias) are observed also in other impact structures. Fig. 13. 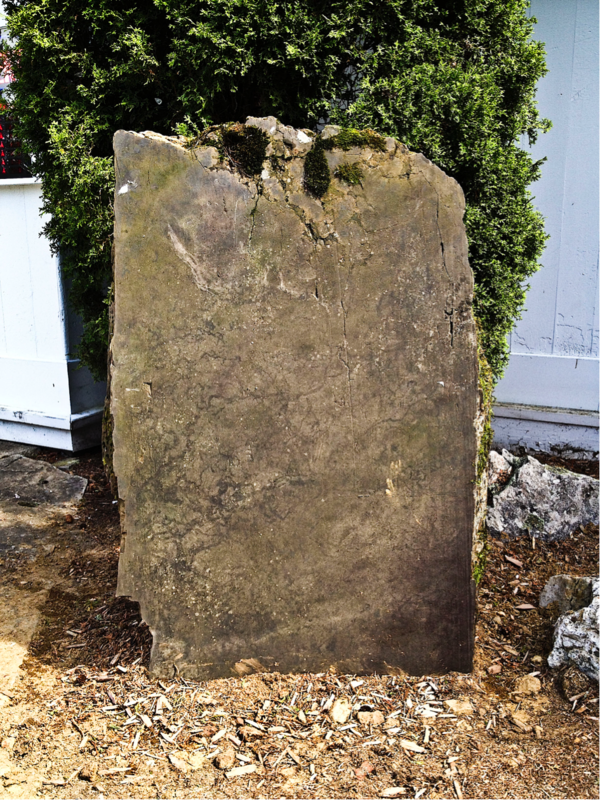 A pseudotachylite “monument”. 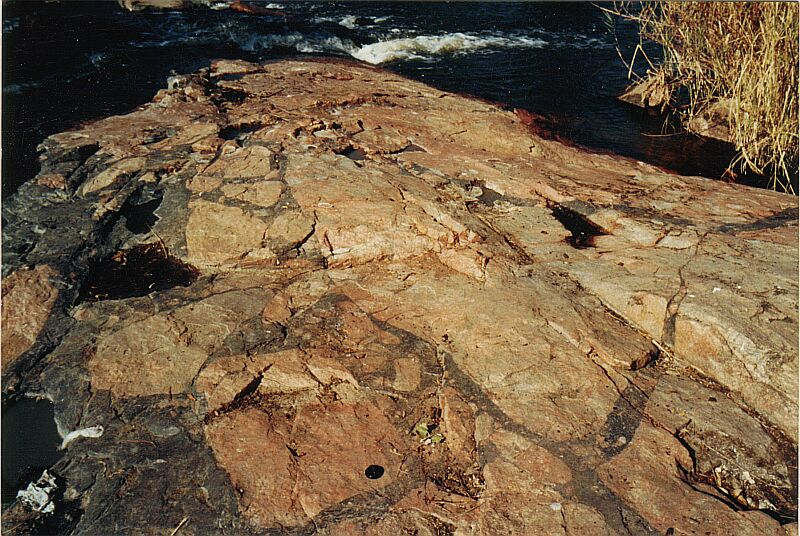 Pseudotachylite in the Charlevoix impact structure does not only appear as a complex network of black centimeter- and decimeter-sized veins (like in the Vredefort impact structure), but also in irregular or tabular bodies up to a few meters thick and often with subrounded fragments (Rondot 1989). Fig. 14. Cliff of limestone revealing structural deformations related with the impact event (final movements in the modification stage? ).